Still, for the time being, a zealous federal prosecutor could seek the death penalty for certain drug traffickers on the basis of drug quantity alone. 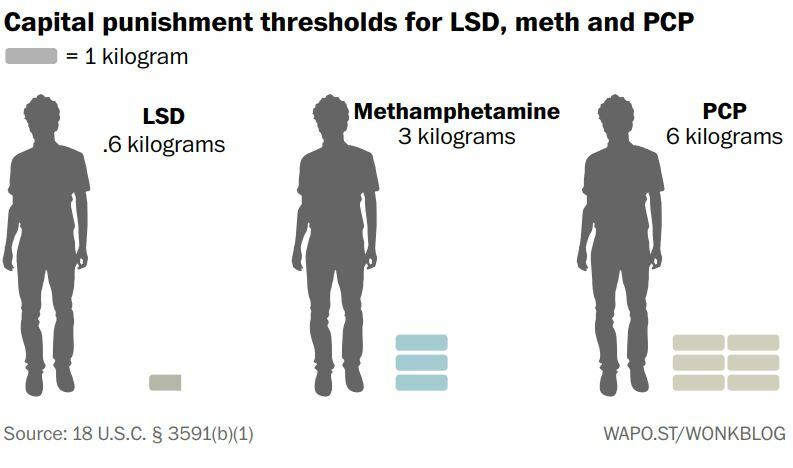 In the accompanying graphics, we visualized those quantities relative to a 6-foot-tall American man. For meth, the threshold is three kilograms. Similarly, six kilograms of PCP, or angel dust, would trigger the death penalty. PCP use is relatively uncommon – the number of Americans reporting use in 2016 rounded to zero, according to the National Survey on Drug Use and Health. 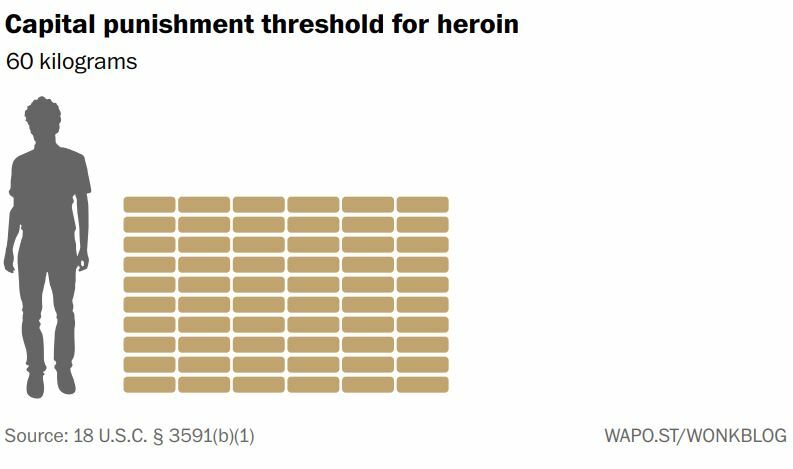 The capital threshold for heroin is 60 kilograms – small enough to move in a few suitcases or the trunk of a small car. Related: New Sessions memo pushes death penalty for big drug dealers. That could include legal marijuana business owners. 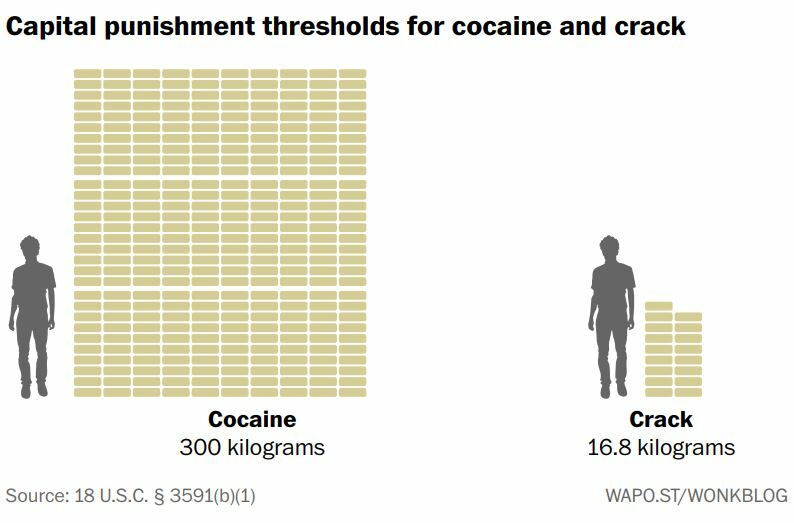 Three hundred kilos of pure cocaine is enough to trigger the death penalty, but as in many areas of federal law crack-cocaine (“cocaine base,” in statutory parlance) is treated much more harshly, with a threshold of 16.8 kilograms. The two substances are chemically identical, but crack is treated 18 times more severely under federal law – a relic of racial drug sentencing disparities that have traditionally treated African American drug users much more severely than white ones. 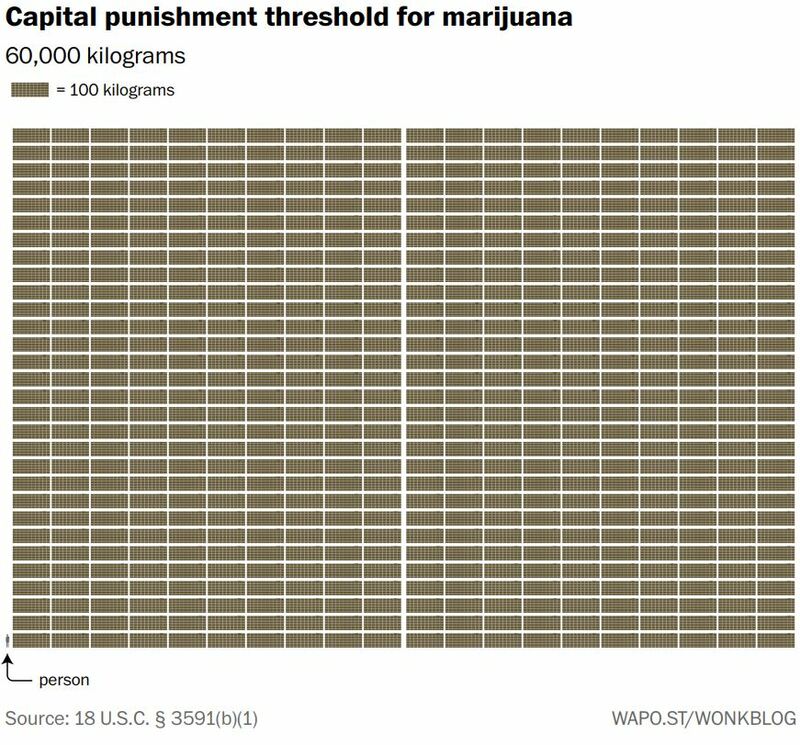 Finally, there is a federal capital punishment on the books for large quantities of marijuana – a substance with no known lethal dose that is legal for recreational use in nine states plus the District of Columbia. The threshold is huge – 60,000 kilograms, or 60,000 plants, enough to fill several shipping containers.